In the July 2011 issue of Family Fun, the Backyard Fun Badge was presented. For ten months, there will be a monthly challenge for families to do. There are three options from which to choose. By doing the activity, you earn a badge (either use the one in the magazine or download from the computer). Then go online and tell them what you did and enter their sweepstakes for a chance to win prizes. One of the ideas that caught my eye for July was option #2 – Host a Campout. Although they suggested sleeping out under the stars, we don’t have a tent so we opt to spread out a blanket and pillows and enjoy spending part of the day outside. Make biscuit dough mix according to the directions on the box or a recipe. Take a hot dog and wrap the biscuit dough around the hot dog (completely or just a center wrap). Be careful not to put too much dough on or your hot dog will not cook. 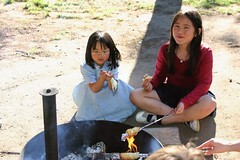 Toast your “dough boy” over hot coals until it is cooked through and golden brown on the outside. Serve with catsup or mustard. When I directed a camp program for children, one of the meals that we taught the children to make was All in One Wrapped in Foil Dinner. Fold aluminum so that there is a double layer. Put ground beef (about the size of a small hamburger) on foil, in the center. Drizzle a small about of oil on it (about 1/2 tsp). Place carrots and potatoes (to your liking) and then onions. Fold over foil edges to make a flat packet. Be careful to fold over any edge so the package doesn’t leak. Use tongs and place right on the coals. When you hear it “sizzle,” flip it. Flip it often and cook for 7-10 minutes. Open carefully (the foil will be hot!) and poke a potato with a fork. When it pierces it easily, supper is ready. Serve with seasoned salt and catsup. camping one year. It was so much fun! 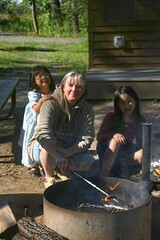 A couple of years ago, Sophia, Olivia, and I went camping with my sister and her two sons. One of the things we made were Brown Bears. All of us liked this easy dessert. 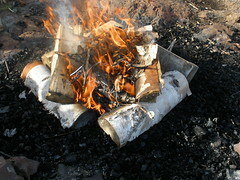 Stretch biscuit dough and wrap around a wooden dowel and roast over coals until brown. Remove biscuit from dowel, spray with margarine and roll in cinnamon and sugar mixture. Fun to make and tasty too. For another dessert, there’s a special treat that reminds me of when I was growing up and took a kids cooking class. It’s a chocolate-banana melt dessert that was featured in the June/July 2011 issue of Family Fun. To make the dessert, cut a lengthwise slit in a peeled banana and place it on a sheet of alumninum foil. Stuff in as many chocolate chips and mini marshmallows as you can fit. Wrap the foil around the banana and place it on a grill for about five minutes. The melt, once cooled, is best eaten with a spoon (and lots of napkins). One of the recipes on the Family Fun website is for homemade granola bars. Heat the oven to 350º F. Coat a 9- by 13-inch pan with nonstick cooking spray and set aside. Transfer the mixture to the baking pan. Using a sheet or waxed paper and the palms of your hands, press the granola firmly into the pan, packing it to a flat and even thickness. Bake for 20 minutes, until golden brown. Allow the granola to cool 1 hour in the pan, then transfer to a wire rack to cool completely before cutting into bars. Makes 16 to 24 rectangular bars. Now it’s your turn to share some of your kid-friendly summer activities! 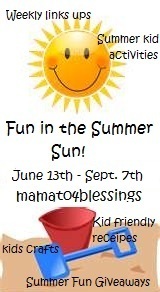 Welcome to the second time of our Fun in the Summer Sun event! With the Fourth of July right around the corner, Sophia, Olivia, and I focused on creating crafts and decorations for the holiday. I decided to take a Chinese spin on the holiday this year since there’s a Chinese connection with a symbol associated with the Fourth of July: fireworks. Also, origami (or paper folding) has ties to China. Both China and Japan are countries that have a long history associated with origami. This timeline shows the history of origami and paperfolding throughout the world. With both Sophia and Olivia being adopted from China, having opportunities to link their birth- country and culture with American holidays and traditions, is important. and red, white, and blue circles. We made crane ornaments from red scrapbooking paper as well as red, white, and blue circles (also from scrapbooking paper). Hangers for the cranes and circles were made from a double-length of thread. At the bottom of the base, we put clear/white and red marbles. Then, we inserted several bare branches. The girls put the origami cranes and circles onto the branches. The painting in the background behind the origami crane tree was hand-painted in China – not with a brush but entirely with his hand and fingernail. The artist used the side of his hand or tip of the fingernail dipped in ink to create the image. There was no design or pattern used to create the image – he just painted as he went along. It’s a fascinating process to watch. during the 4th of July parade. get a tremendous amount of candy. Each year, we go to a parade on the 4th of July, and it seems like there’s always candy being thrown to the children. 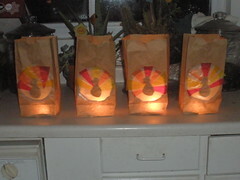 The girls like to bring a little bag to collect the candy they pick up, so we made these bags from a variety of decorative papers and paper with Chinese printing/characters. The paper with Chinese characters on it is from a little booklet given out at a hotel in China. It is from the last hotel we stayed in before heading back to the United States when Olivia was adopted. It was in a collection of items that were brought back from China to show her when she was older. scrapbooking paper and paper from China. 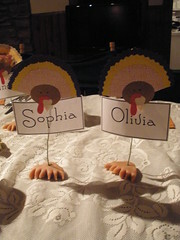 This idea came from the May 2011 issue of Family Fun. Instead of crafting with paper, you craft with food and are able to eat it afterwards. For geometric wraps, simply trim flour tortillas into squares, spread them with fillings (e.g., peanut butter and raspberry jam; cream cheese and blueberry jam). With red, white, and blue fillings – you have a great tie-in with 4th of July. to make it fit the red, white, and blue theme. For a puppy face treat, fold a square tortilla in half on the diagonal and then fold two corners in and down to make the ears. You can make a face on the tortilla with fruit from the jam, olives, or food markers. for eyes and a nose. You can fold the tortillas any way you want – be creative! Just make sure that you don’t put too much peanut butter, jam, or other filling on the tortilla or it won’t be able to fold properly. Either that…or it will ooze out. And that just doesn’t look as appetizing compared to treats with all of the contents inside them. Sophia folded another sandwich in a different way. Lap quilt that Sophia made. She learned six new quilting patterns. Olivia looked through my sewing and embroidery patterns folder, and found a pattern to make a donkey. The directions recommended sewing the donkey on the sewing machine, but Olivia wanted to sew it by hand using embroidery stitches she knew. Olivia using the blanket-stitch to sew her donkey. She completed it in less than a day. It stands about ten inches tall. The donkey is made from 100% hand-dyed wool felt and stuffed with wool from sheep I use to raise. to decorate the purple blanket. She is so happy with the donkey she made, and now has a new stuffed animal with which she can play. What is your Kid-friendly Summer Craft(s)? Easter was on Sunday, April 24th. The girls did some activities at home before Easter to celebrate the holiday. One of the things they look forward to doing each year is coloring eggs. Olivia’s hard-boiled eggs sitting in cups of dye. Sophia and Olivia each dyed six eggs. The girls also made Resurrection Buns. They each had eight triangles of crescent roll dough. They rolled a marshmallow in dairy-free butter and then in sugar/cinnamon mix. Next, they wrapped the dough around the marshmallow and made sure there were no holes. They baked them and when they came out of the oven, the marshmallow had melted leaving a gooey mess of melted marshmallow, butter, cinnamon, and sugar. The Resurrection Buns have no nutritional value and are very unhealthy. Yet, they tie in with the Easter story…that’s the justification for making and enjoying them! Sophia making her batch of Resurrection buns. A new thing we made this year were Italian Easter Egg Baskets. They are called Pupa Cu L’ova and basically they are dough wrapped around a dyed, hard-boiled egg. Olivia with the baked (but undecorated) Pupa Cu L’ova. After the dough-basket is cool, it is frosted and decorated with sprinkles. The idea came from a recent issue of Living Crafts magazine. They didn’t have a name for it in the magazine, only an explanation that the magazine editor’s daughter received one of these pastries from her teacher at her Waldorf school. Sophia’s and Olivia’s Italian Easter Egg Baskets. They want to do them again next year. For breakfast, one of the recipes I tried this year was from a past issue of Family Fun magazine. Basically, it is making scrambled eggs and putting them in hash-brown baskets/nests that were baked in the oven. After breakfast, the girls sang in the children’s choir. They both did a nice job singing. We went over my parents’ home to have Easter dinner and to celebrate my mom’s 81st birthday which falls directly on Easter this year. In her 81 years, she said that this was the first time that Easter was ever on her birthday. “It’s been on the 23rd, but never on the 24th,” she said. Olivia holding the Easter lamb cake that she helped make and decorate. For many years now, she has wanted to help make this cake. Having Easter lunch at my mom and dad’s home. didn’t have to do any cooking. We enjoyed dessert, the children played outside on the deck, and then headed down to the dock to play in the lake. They played games outside and had fun spending time together. Inside, my mom opened birthday gifts and she handed out Easter baskets that she made for each of the children. My mom opening a present from my dad. since he no longer can drive (due to Alzheimer’s Disease). So my sister and I got some gifts for him to give to my mom. Needless to say, she was very surprised and teary as she opened each gift. The girls and I made two batches of cookies today. I’ve had the recipe for Chocolate Waffle Cookies for four years. This year we finally made them. They were amazing! In a microwave, melt butter and chocolate; stir until smooth. Transfer to a large bowl and cool completely. Beat in eggs and vanilla. Combine flour and sugar; gradually add to egg mixture. Drop by tablespoonfuls 1 inch apart onto a preheated waffle iron. Bake for 1 minute or until set. Remove to a wire rack to cool completely. 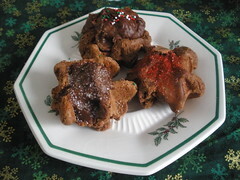 For frosting, in a microwave, melt butter and chocolate; stir until smooth. Transfer to a small bowl. Beat in vanilla. Gradually add confectioners’ sugar alternately with water, beating until smooth. Frost waffle cookies to within 1/4 in. of edges. Decorate with glitter and jimmies if desired. Let stand until frosting is set. The other recipe we made was for Santa Hats. They’re actually meringue cookie that are supposed to be in the shape of Santa hats. The idea came from Family Fun magazine (Dec/Jan 2008 issue). I’ve made Santa Hats in 2008 and 2009, but this is the first year that I let the girls try to make the Santa hat shapes. After a couple tries, they ended up making different shapes and then decorating them with colored sprinkles. 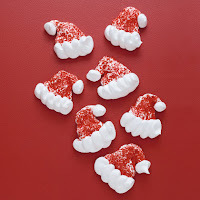 They had a lot of fun doing this, and it continued an annual tradition of making these cookies. The process – the enjoyment of baking cookies – is what’s important…not what the final product looks like. Who knows…perhaps next year the girls’ creations will look more like hats. Heat the oven to 200º F. With an electric mixer, beat the egg whites until soft peaks start to form. Beating all the while, add the cream of tartar and vanilla extract, then slowly add the 1/2 cup of sugar. Continue to beat until the peaks stiffen. Spoon the meringue into a quart-size plastic bag. Snip off a corner and pipe 2 dozen 1 1/2-inch-tall Santa hat triangles onto a parchment-lined baking sheet (you should have about 1/4 of the meringue left). Sprinkle the triangles with the red sugar, then use the remaining meringue to give each one a pom-pom and trim. Bake the hats until they’re hard but not browned, about 1 hour and 20 minutes. Turn off the oven and leave the hats in it for an hour to crisp before removing. “Art Every Day Month” encourages people to be creative each day – whether it’s in the visual arts, music, in the kitchen, writing, or photography. It’s up to each participant. So, today one of things I did was try a new recipe from “Family Fun” magazine. I needed something quick to prepare. The recipe called for pre-made, frozen meatballs. I chose to make and bake homemade meatballs instead. 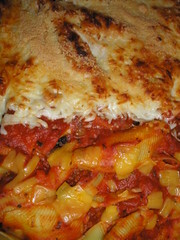 While they were baking, I made the jumbo pasta shells and drained them. I greased a 9×13 inch pan and put about a half cup of spaghetti sauce into the bottom of the pan. Once the meatballs were done, I put one in the center of each jumbo pasta shell and placed it into the pan. Had a few bits of pasta left, so those went on the top. Then, I put the rest of the spaghetti sauce on top of the shells. On 2/3 of the casserole, I put 2 cups of mozzarella and Parmesan cheese; and the other 1/3 had dairy-free cheese so Sophia could eat it (she has a dairy allergy). Served herb bubble bread with the pasta dish. Everyone’s plate was clean which is a good sign. It’s a very easy recipe to prepare and one that is worth repeating.